Loop Powered! The OMEGA™ 2-wire TX94A-SS Series temperature transmitters are high-performance, industrial transmitters designed for direct connection to most CIP (clean-inplace) Hygienic Pt100 probes and sensors that incorporate a M12 style connection. All models feature a miniature signal conditioner built into a sealed stainless steel connector housing. The signal conditioner converts the resistive change of a 100 Ω, 0.00385 RTD probe or sensor into an industry-standard 2-wire, 4 to 20 mA analogue output across a dedicated temperature range. Output connection is also a standard M12 connector. The TX94A-SS transmitter is provided with two RTD wiring configurations as shown. The wiring style is identified at the end of the model number by either a "-1" or "-2". If used with an Omega PR-21 sensor, then the "-1" or "-2" selection should match the final charecters following the "-M12" in the sensor model number (ie: PR-21A-3-100-A-1/4-0600-M12-1). When using the transmitter with an Omega PR-22 style RTD, then please select the -2 wiring configuration. For use with a PR-21A-3-100-A-1/4-0600-M12-1, use an TX94A-2-SS-M12F-1 Transmitter (Range is -18 to 93°C). 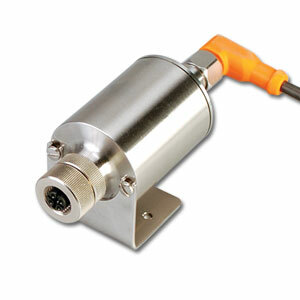 For use with a PR-22-3-100-A-M6-250-M12 sensor, use an TX94A-2-SS-M12F-2 Transmitter (Range is -18 to 93°C). Nota: The TX94A-SS series has not been designed for use in medical or nuclear applications, nor flammable or explosive environments.